Vol. 6, No 2, WATANABE Moriaki et al. Paddy fields in Northeast Thailand are unusual in that they contain large trees. In recent years, however, in concert with major changes in the agricultural system of Northeast Thailand, including the shift from subsistence to cash crops, mechanization, use of chemical fertilizers, and increased reliance of rural people on manufactured consumer goods, the role of trees in paddy fields has also been changing, leading to a decline in tree densities. 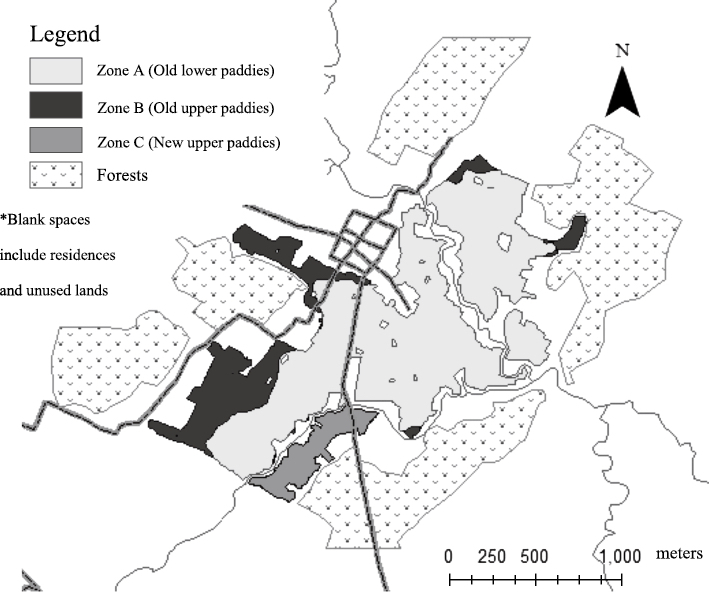 This study was conducted in Khok Kwang village, Khon Kaen Province, in order to examine factors influencing variations in density, canopy coverage, and origin of trees in paddy fields there. In recent years, the rate of tree cutting appears to have been increasing and the density of trees declining. This decline reflects many changes in agricultural practices in the village. Farmers now rely on chemical fertilizer rather than litter from the trees to maintain soil fertility. They no longer value any increase in rice yield during dry years in the parts of their fields that are close to the trees because they are now able to pump irrigation water to maintain productivity; and trees are seen as an impediment to the use of four-wheel tractors, which have difficulty working efficiently in paddy fields with many trees. In addition, several farmers have begun to plant their paddy fields with sugarcane, which is less shade tolerant than rice. The density of trees in paddy fields planted with sugarcane (5.7 trees/ha) is much lower than in fields where rice is cultivated (9.6 trees/ha). In upper paddies that are still planted with rice, the trees are retained because they provide valuable goods and services to the farmers and rice yields there are in any case low and unstable. This study illustrates at the micro level how changes in farmer goals, choice of crops, and production technology that are part of the agrarian transformation of Northeast Thailand are reshaping the rural landscape. Paddy fields in Northeast Thailand are unusual in that they usually contain large trees. These fields are not just rice paddies but multi-resource systems providing a wide variety of goods and services to the rural people (Heckman 1979; Grandstaff et al. 1986; Rambo 1991; Patma 1993; Buared 2000). The trees provide food and medicine, firewood, lumber, small timber, non-timber products, and shade (Grandstaff et al. 1986; Buared 2000). They contribute organic matter to the soil (e.g., Sunee et al. 1992), which serves as a nutrient reserve and leads to higher cation exchange capacity (Patma 1993). Trees also provide fodder and shade to livestock as well as serve as habitat for various wild species, including insects, birds, and other animals (Grandstaff et al. 1986). In recent years, however, in concert with other major changes associated with the ongoing agrarian transformation of Northeast Thailand—including the intensification of rice production, shift from subsistence-oriented farming to raising cash crops, mechanization, use of chemical fertilizers, and increased reliance of rural people on manufactured consumer goods—the role of trees in paddy fields has also been changing, leading to a general decline in tree density. However, only a few surveys have been made of the density of trees in paddy fields in Northeast Thailand and central Laos (ibid. ; Watanabe et al. 1990; Buared 2000; Kosaka et al. 2006; Matsushita et al. 2011). They found a wide variation in number of trees per hectare, ranging from none to more than 150. A recent survey of tree density in paddy fields for the whole of the Northeast region revealed the mean density of trees in paddy fields was 12.1 trees/ha (Watanabe et al. 2014). In general, the northern part of the region has much lower densities of trees than the southeastern part. 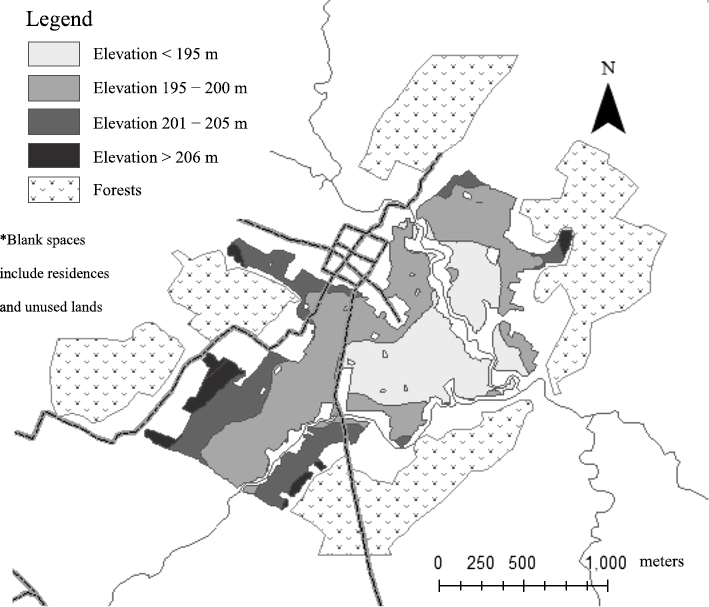 Density was found to be influenced by multiple factors: (1) the history of land development, with older fields displaying lower densities than newer fields; (2) topography, with fields located at higher positions in the toposequence having higher densities than those located in lower areas; (3) access to natural forest resources, with areas close to forests having higher densities than areas farther away; (4) amount of annual rainfall, with areas of higher rainfall having higher densities than areas of lower rainfall; and (5) landholding size, with areas of larger-sized landholdings having higher densities than areas of smaller-sized landholdings (ibid.). The kinds of crops planted in the paddy fields (in the past almost always rice but recently sometimes sugarcane or cassava) also influence density since trees reduce yields of shade-intolerant crops. Rice is more tolerant than field crops such as cassava and sugarcane, which leads farmers to cut down trees if they plant these field crops (Patma 2001). Although the degree of shading in fields is related to the extent of the trees’ canopy coverage, no studies have been published on this aspect of trees in paddy fields. The trees in paddy fields in Northeast Thailand have different origins: (1) forest survivors that have persisted from the original forest; (2) volunteers that have naturally generated from seeds brought into the system through various means; and (3) trees that were intentionally planted by the farmers (Patma 1993; 2001). Because tree management in paddy fields gradually evolves from a state of high tree density with little human care to one of low tree density with intensive human intervention, forest survivors come to be replaced by volunteers and planted trees with the passage of time (Grandstaff et al. 1986; Kosaka et al. 2006). Although some studies conducted in Laos have described spatial variability in the occurrence of trees in paddy fields at both the community and plot levels (Kosaka et al. 2006; Matsushita et al. 2011), no systematic surveys of variability in tree density, canopy coverage, and origins of trees in paddy fields have been done at the community and plot levels in Northeast Thailand. Therefore, we undertook this study to investigate the density, extent of canopy cover, and origin of trees in paddy fields and to identify factors influencing these variables in a single rainfed rice-farming community in Northeastern Thailand. Of the five factors found by Watanabe Moriaki et al. 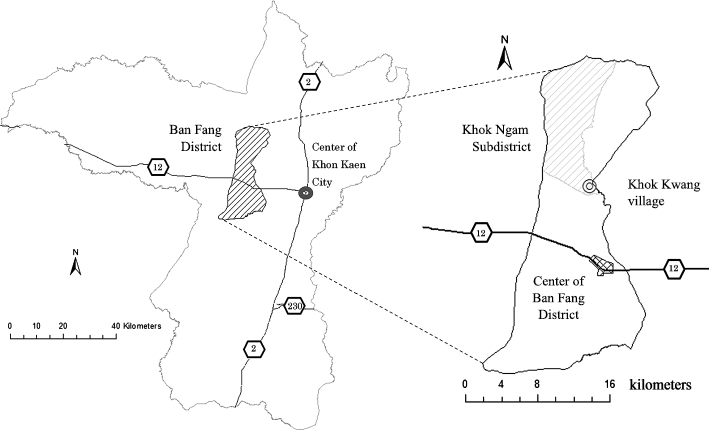 (2014) to influence the density of trees in paddy fields, three factors (access to natural forest resources, amount of annual rainfall, and landholding size) are not differentiated in the study community of Khok Kwang village, so they cannot be a source of variation in tree densities in various parts of the village. Therefore, only two factors, i.e., the history of land development and topography, were examined in the present study. The paddy fields in the village were classified into three zones based on their history of clearance and their topographical position in the landscape. The density and canopy cover of trees in paddy fields were calculated in each zone by analyzing satellite images downloaded from Google Earth. The origins of the trees in selected plots in paddy fields in each zone were recorded based on information provided by the farmers. The effects on tree density of the recent change from growing rice to sugarcane in paddy fields was also investigated in the selected plots based on observation and interviews with farmers. Khok Kwang village, Khok Ngam Subdistrict, Ban Fang District, Khon Kaen Province (Fig. 1), was selected for study for three reasons: the first author has a long-term relationship with the villagers, which facilitated the collection of reliable information; it is a community with a relatively low density of trees; and it is easily accessible. Khok Kwang village (16°32′N, 102°38′E) was established in 1920 by seven households that moved there from other areas. An unpaved road to the village that was usable only in the dry season was constructed in 1967. Access to the village during the rainy season became easier after the road was paved in 2007. According to the basic village-level information database (NRD-2C) of the Community Development Department, there were 100 households and 448 people in the village in 2005. There is a difference in elevation of about 30 meters between the highest (220 m above mean sea level) and lowest (190 m) points in the village. Fig. 2 shows the pattern of land use in Khok Kwang village. Forests are located in the northern and southern areas and on the top of hilly areas. Most of the lower areas have already been developed into paddy fields. All of the forests belong to the Royal Forest Department, which planted eucalyptus trees in both areas in 1977. The villagers are not allowed to cut trees without permission from the forest department but are permitted to collect firewood and graze cattle in the forests. The villagers like to collect mushrooms in the forests at the beginning of the rainy season. The main stream, Huay Yai, flows from the northeast to the southwest of the village. A Huay Yai weir, was constructed in 1975–76. However, the weir collapsed two years later and was reconstructed only in 1986. Since then, about 67 ha (400 rai) of the lower paddies have been irrigated from the weir (Fukui and Hoshikawa 2009). The total area of agricultural land in the village is 165.4 ha. All of the arable land is paddy fields. The mean landholding size per household is 1.65 ha. According to the NRD-2C for 2005, there was little or no differentiation of landholding size among the villagers and no household had more than 3.5 ha. All households engage in rice cultivation and also raise cattle and buffalo. They can grow rice only once each year in the rainy season. All farmers plant the popular RD6 variety of glutinous rice and make use of chemical fertilizer and pesticides. According to the NRD-2C for 2005, only rice was then planted. However, since that time sugarcane cultivation in the paddy fields has been expanding. This is because growing sugarcane requires less labor and brings about much higher profits per hectare than rice. In recent years, shortage of agricultural labor has become a serious problem for the villagers because many younger adults have left the village to seek non-farm employment in the city. A high-resolution satellite image (QuickBird) obtained from Google Earth was used in this study. The resolution is sufficiently high to allow the identification of the boundaries of paddy fields and the location of trees within these fields using the naked eye. The satellite image covering Khok Kwang village was taken on November 7, 2004 and downloaded in October 2010. The boundaries of the village and the individual paddy fields were identified by checking the satellite image with the help of key informants from the village. Key informants who were knowledgeable about the history of the village were interviewed about the history of land development, especially that of the paddy fields. They divided the agricultural area of the village into two types: (1) the area where most of the paddies were developed before 1945 (154.2 ha), and (2) the area where most of the paddies were developed after 1945 (11.3 ha). A map showing these two types was made using ArcView (Fig. 3). The elevation above mean sea level was determined using Google Earth. Based on their elevation, paddy fields of the village were divided into four areas—<195, 195–200, 201–205, and >206 meters—and the boundaries of these areas were mapped using ArcView (Fig. 4). The paddy fields were divided into three zones based on information on the history of land development and topography (Fig. 5). Zone A includes the areas with an elevation of 200 m or less where the paddy fields were developed mostly before 1945. Zone B includes the areas with an elevation of 201 m or higher where the paddy fields were developed mostly before 1945. Zone C includes the areas developed after 1945 that have an elevation higher than 201 m above sea level. All of the trees inside the boundaries of the paddy fields, including those on the bunds around the fields, in the satellite image were counted using the naked eye. In a few cases, when several trees formed a single cluster and it was not possible to count each tree individually, the whole cluster was counted as one tree. Twenty-nine households were randomly selected from the 100 farm households in the village, and one plot for each sample household was randomly chosen from their holdings. The 29 plots had a total area of 10.7 ha, accounting for 6.5% of the total area of paddy fields in the village. Of the 29 plots, 11 (3.1 ha) were in Zone A, 11 (5.6 ha) in Zone B, and 7 (2 ha) in Zone C. They were kept under observation from October 2010 to July 2011. Members of households who owned the plots were asked to identify the names and origins of all of the trees standing in their plots. They were also asked about the reasons they retained the trees and their future plans for them. The overall mean density of trees in paddy fields in Khok Kwang village was 7.3 trees/ha. The densities in Zones A, B, and C were 5.1, 12.4, and 18.4 trees/ha respectively (Table 1). 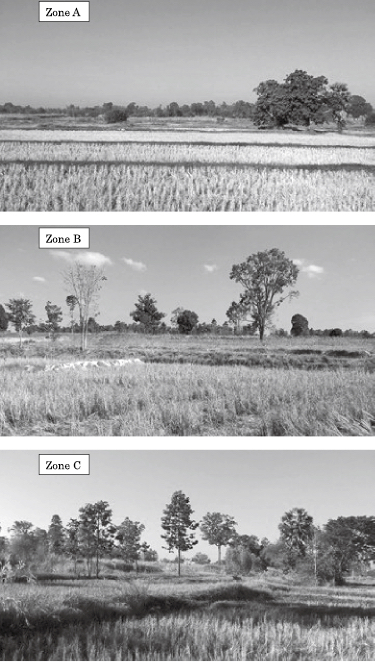 Photographs showing trees in paddy fields representing each zone are shown in Fig. 6. The mean area of canopy cover per tree was 55 m2, and the total area under canopy accounted for 4% of the total area of the paddy fields. The share of the total field area occupied by tree canopies was much lower in old lower paddies in Zone A (2.6%) than in old upper paddies in Zone B (7.3%) or in newer upper paddies in Zone C (10%). Trees in Zone B had a higher mean area of canopy cover (59 m2) than those in Zone A (52.7 m2) or in Zone C (54.4 m2) (Table 1). Table 2 shows variations in the area of the canopies of individual trees in paddy fields in each zone. The difference in the area of canopy cover in Zone B compared to Zones A and C is highly significant (|p| ≤ 0.01) according to the Mann-Whitney U test. 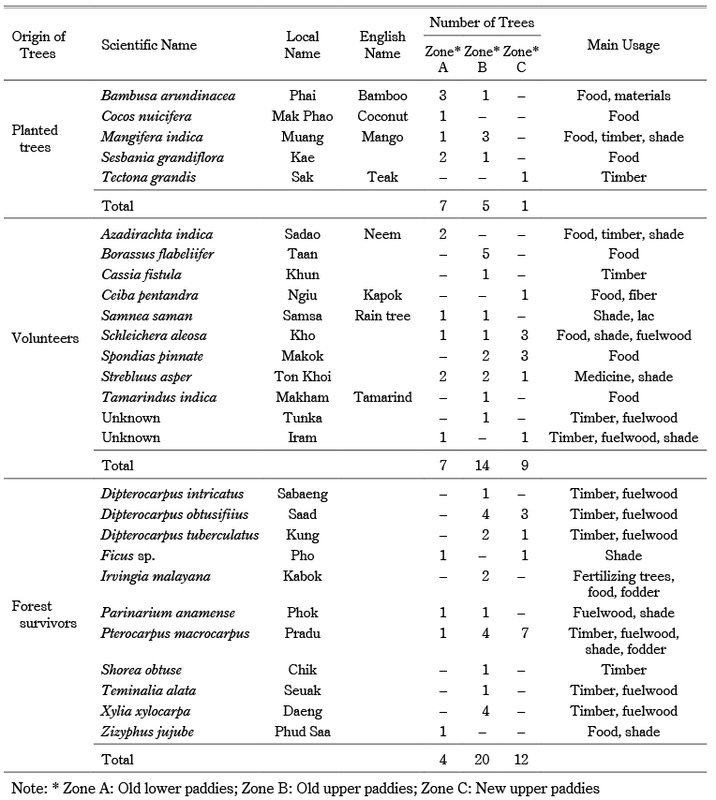 In 10.7 ha of the 29 sample plots, there were a total of 79 trees belonging to 27 species (Table 3). Of these trees, 13 (16.4%) were planted trees, 30 (38%) were volunteers, and 36 (45.6%) were forest survivors. The volunteers are supposed to be generated from seed provided by nearby forest. However, forest trees in this village have been replaced by eucalyptus. Therefore, the forest is not a source of seeds for trees in the paddy fields. The origin of trees in each zone seems to be different (although since the 29 plots were not selected in proportion to areas of the zones, testing for statistical significance is not possible). In Zone A, 38.9% were planted trees while the forest survivors were only 22.2%. On the other hand, in Zone C only 4.5% were planted trees and 54.5% were forest survivors (Table 4). Thus, it appears that multipurpose resource systems have been kept mainly in upper paddies. The villagers said that they expected to keep 72 of the existing 79 trees (91.1%) in their fields in the future. Details of the process of land reclamation cannot be reconstructed with precision because the villagers do not remember when each paddy plot was reclaimed. However, according to some key informants, the oldest paddies are located in lower-lying parts near Huay Yai Stream and were established around 1920. Many villagers agreed that they started reclaiming lower areas first and then expanded the area toward upper ground little by little. The process of paddy field reclamation in the village was quite similar to what has been reported elsewhere in Northeast Thailand (Takaya and Tomosugi 1972; Fukui 1993; Patma 1993; 2001; Buared 2000). Thus, we can say with some confidence that the villagers first developed the paddies in lower parts of Zone A and then expanded them into middle and upper parts of Zone B. The higher land in Zone C was only developed much later. The density of trees in paddy fields clearly reflects this history of land reclamation, with the oldest paddies having much lower densities than the more recently developed ones (Table 1). The history of land development is reflected also in differences in the origins of trees, the area under canopy cover, and mean canopy area per tree. Zone A has the lowest percentage of forest survivors (22.2%) and highest percentage of planted trees (38.9%). The share of the area under canopy cover is highest in Zone C—10%, compared to 7.3% in Zone B and only 2.6% in Zone A—but the mean canopy area per tree is larger in Zone B (59 m2) than in both Zone A (52.7 m2) and Zone C (54.4 m2) (Table 1). Somluckrat Grandstaff et al. (1986) and Kosaka Yasuyuki et al. (2006) have pointed out that large-trunked trees have high lumber value so tend to be retained by the farmers, whereas smaller trees are cut down little by little. Therefore, it is likely that in old upper paddies in Zone B the small canopy trees were selectively cut down, leaving only clustered trees and individuals with larger canopies. In the oldest paddies in Zone A, however, the forest survivors have mostly been replaced with smaller canopied volunteer and planted trees, which are younger with smaller trunks. Topography itself may be a direct determinant of the density of trees in paddy fields. Although more than 65 years have passed since the reclamation of paddy fields in Zone B, the density of trees there is still much higher than in Zone A, where the paddies were developed only slightly earlier. This difference may in part reflect the differences in native vegetation. It is likely, although it cannot be proven, that the lower-lying fields in Zone A were established by draining wetlands that had never supported very many trees. It is probable that both topography and the history of land use influence the canopy cover and the origin of trees in paddy fields. Because topography and the history of land development of paddy fields tend to co-vary, it is difficult to separate the effects of one factor from the other. It is evident, however, that in the lower paddies in Zone A, many of the larger-canopied trees that have a negative impact on rice have been cut down and smaller-canopied ones have been planted in their place. Every farmer interviewed stated that trees in paddy fields have a negative impact on rice yield. Although rice plants in the vicinity of trees may exhibit excellent vegetative growth, this rarely translates into improved grain yield since the increased plant height makes the rice plants susceptible to lodging. Moreover, the excessive vegetative growth produces fewer tillers and a smaller number of grains per panicle. These findings are in agreement with previous studies (Grandstaff et al. 1986; Craig 1988; Sunee et al.1992; Patma 1993). Although some farmers in other parts of the region reportedly believe that the yield from rice plants close to the trees is higher than in other parts of the field in dry years (Grandstaff et al. 1986; Craig 1988; Patma 1993), the farmers in Khok Kwang village think that having no trees in paddy fields is the best option for rice production. Even if tree shading actually increases the yield in dry years, this is no longer important, at least in the lower paddies, because the lower paddies can be irrigated by the weir constructed in 1986. Although farmers used to value trees because their litter fall helps improve soil fertility (Grandstaff et al. 1986; Patma et al.1988; Sunee et al. 1992; Patma 1993), most farmers now rely mainly on chemical fertilizer rather than litter from the trees. The use of four-wheel tractors and combine harvesters has become popular in the lower paddies in recent years. The machines have difficulty working efficiently in fields with many trees. As a result of these changes in technology, there are few incentives to keep trees in lower paddies anymore; consequently, these paddy fields are being shifted to single-purpose resource systems that just produce crops. Farmers who have upper paddies also plant the RD6 rice variety, use hand tillers for preparing the land, and apply chemical fertilizer in the same way as they do in the lower paddies; but because soil fertility, nutrient retention capacity, and water availability in upper paddies are all inferior compared with the lower paddies, they do not expect to get a high yield of rice from the upper paddies. In spite of the negative impact of trees on rice yield, upper-paddy farmers tend to retain them because the value of the foregone rice yield is not so much as it is in the lower paddies. The benefits provided by the trees surpass the value that might be gained from the potentially higher rice harvest if they were cut down. Thus, the upper paddies are still kept as a multi-resource production system. The sustainability of the system, however, is questionable. Since the villagers can now purchase many of the goods that the trees in paddy fields provide, the value of such trees appears to be declining. The difference in tree density between Zones A and B may be a reflection of differences in the relative rice-producing capabilities of the upper and lower paddies. The lower paddies are thought of as having more reliable water, more fertile soils, and better responsiveness to fertilizer inputs (Table 5). Consequently, farmers are less willing to tolerate reduction in rice yield caused by tree shading in the lower paddies than the less productive upper ones. In recent years, especially after the access road to the village was paved in 2007, farmers began to plant sugarcane instead of rice in both upper and lower paddy fields. This change was driven by their increasing need for cash income. Farmers could earn much more cash by selling sugarcane than rice. Because sugarcane is less shade tolerant than rice (Yaowalak et al. 1987), villagers tend to cut down trees in paddy fields when they start to grow sugarcane. They selectively cut down trees with larger canopies. Consequently, the density of trees in paddy fields where sugarcane is cultivated (5.7 trees/ha) is lower than in fields where rice is cultivated (9.6 trees/ha) (Table 6). This study found that many factors affect the retention or cutting of trees in paddy fields in Khok Kwang village. The history of land development, topography, adoption of modern agricultural technology, and kind of crops grown are the main factors influencing density, canopy cover, and origin of trees in paddy fields. In general, older, lower-elevation paddies have lower tree densities, a smaller share of the total field area covered by canopies, and smaller areas of canopy per tree, as well as a smaller percentage of forest survivors and a much larger share of planted trees than more recently developed upper paddies. It was also found that recent changes in the production technology of rice, especially the use of chemical fertilizer, pumps for supplementary irrigation, and tractors and combine harvesters, as well as the replacement of rice with sugarcane in some fields, are leading to a decline in tree density. Farmers now rely on chemical fertilizer rather than litter from the trees to maintain soil fertility, and trees are seen as an impediment to the use of four-wheel tractors and combine harvesters. Moreover, sugarcane is a less shade-tolerant crop than rice. Because of all these factors, farmers think reducing the number of trees in paddy fields is the best option for increasing crop production (Table 7). Despite this negative view, trees in the upper paddies may be retained because they still provide valuable goods and services to the farmers and the resulting reduction in rice yield is not seen as critical because rice yields are in any case low and unstable. However, if farmers choose to plant shade-intolerant cash crops such as sugarcane and cassava in the upper paddies, even these trees may be cut down rapidly. The recent decline in the density of trees in paddy fields in Khok Kwang village illustrates how changes in farmer goals, choice of crops, and production technology are reshaping the rural landscape. This is another aspect of the agrarian transformation in Northeast Thailand. This paper is based on research carried out as part of the first author’s doctoral study in the Program on System Approaches in Agriculture of the Faculty of Agriculture, Khon Kaen University. Writing of this paper was partially funded by a grant (BRG5680008) from the Thailand Research Fund (TRF) Basic Research Program to the corresponding author but the views expressed in it are not necessarily shared by TRF. The second author’s affiliation with the Soil Organic Matter Management Research Group, Khon Kaen University is acknowledged. The authors would like to thank Dr. Fukui Hayao for his valuable comments on earlier drafts of this paper and Drs. Suchint Simaraks and Jefferson Fox for their useful suggestions about this research. Buared Prachaiyo. 2000. Farmers and Forests: Changing Phase in Northeast Thailand. Southeast Asian Studies 38(3): 6–178. Craig, Iain A. 1988. Agronomic, Economic and Socially Sustainable Strategies for Soil Fertility Management in Northeast Thailand. In Sustainable Rural Development in Asia: Selected Papers from the Fourth SUAN Regional Symposium on Agroecosystem Research, edited by Terd Charoenwatana and A. Terry Rambo, pp. 153–165. Khon Kaen: Khon Kaen University Farming Systems Research Project and the Southeast Asian Universities Agroecosystem Network. Fukui, Hayao. 1993. Food and Population in a Northeast Thai Village. Monographs of the Center for Southeast Asian Studies, Kyoto University. Honolulu: University of Hawaii Press. Fukui Hayao 福井捷朗; and Hoshikawa Keisuke 星川圭介. 2009. Tamunoppu: Tai, Kambojia no kietsutsu aru seki kangai タムノップ―タイ・カンボジアの消えつつある堰灌漑 [The disappearing thamnop irrigation of Thailand and Cambodia]. Tokyo: Mekon-sha. Grandstaff, Somluckrat W.; Grandstaff, Terry B.; Pagarat Rathakette; Thomas, David E.; and Thomas, Jureerat K. 1986. Trees in Paddy Fields in Northeast Thailand. In Traditional Agriculture in Southeast Asia: A Human Ecology Perspective, edited by Gerald G. Marten, pp. 273–292. Boulder: Westview Press. Heckman, Charles W. 1979. Rice Field Ecology in Northeastern Thailand. The Hague: Dr. W. Junk. Kosaka, Yasuyuki; Takeda, Shinya; Prixar Souksompong; Sithirajvongsa Saysana; and Xaydala Khamleck. 2006. 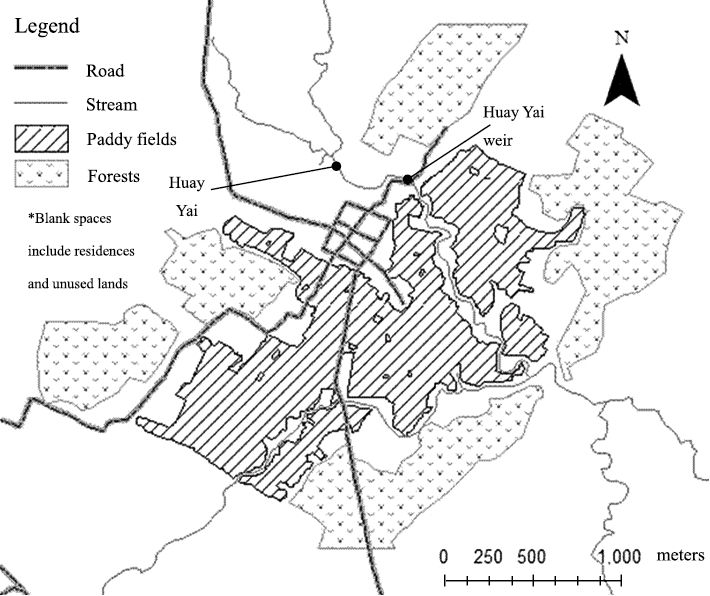 Species Composition, Distribution and Management of Trees in Rice Paddy Fields in Central Lao, PDR. Agroforestry Systems 67: 1–17. Matsushita Yuichi 松下雄一; Hoshikawa Kazutoshi 星川和俊; Miyagawa Shuichi 宮川修一; and Kosaka Yasuyuki 小坂康之. 2011. Buienchan heiya ni okeru sammairin bumpu no tokucho: Raosu, Don Kuwai mura o taisho to shite ヴィエンチャン平野における産米林分布の特徴―ラオス・ドンクワーイ村を対象として [Geographical distribution of tree-rice system in paddy fields in the Vientiane plain: A case study in Dong Khuai village of Laos]. Kankyo Kagaku Nempo 環境科学年報 [Annals of Environmental Science, Shinsyu University] 33: 89–97. Patma Vityakon. 2001. The Role of Trees in Countering Land Degradation in Cultivated Fields in Northeast Thailand. Southeast Asian Studies 39(3): 398–416. ―. 1993. Traditional Trees-in-Paddy-Fields Agroecosystem of Northeast Thailand: Its Potential for Agroforestry Development. Honolulu: East-West Center Program on Environment Working Paper No. 34. Patma Vityakon; Suriya Smutkupt; and Buared Prachaiyo. 1988. Trees in Paddy Fields: Their Contributions to Soil Fertility and Sustainability of the Paddy Rice System. In Sustainable Rural Development in Asia: Selected Papers from the Fourth SUAN Regional Symposium on Agroecosystem Research, edited by Terd Charoenwatana and A. Terry Rambo, pp. 65–86. Khon Kaen: Khon Kaen University Farming Systems Research Project and Southeast Asian Universities Agroecosystem Network. Rambo, A. Terry. 1991. The Human Ecology of Resource Management in Northeast Thailand. Khon Kaen: Faculty of Agriculture, Khon Kaen University. Sunee Sae-Lee; Patma Vityakon; and Buared Prachaiyo. 1992. Effects of Trees in Rice Paddies on Soil Fertility and Rice Growth in Northeast Thailand. Agroforestry Systems 18: 213–223. Takaya Yoshikazu 高谷好一; and Tomosugi Takashi 友杉孝. 1972. Tohoku Tai no “kyuryojo no suiden”: Toku ni, sono “sammairin” no sonzai ni tsuite 東北タイの“丘陵上の水田”―特に，その“産米林”の存在について [Rice lands in the upland hill regions of Northeast Thailand: A remark on “rice-producing forests”]. Tonan Ajia Kenkyu 東南アジア研究 [Southeast Asian Studies] 10(1): 77–85 (in Japanese with English abstract). Watanabe, Hiroyuki; Abe, Kenichi; Hoshikawa, Tomoyuki; Buared Prachaiyo; Sahunalu Pongsak; and Choob Khemnark. 1990. On Trees in Paddy Fields in Northeast Thailand. Southeast Asian Studies 28(1): 45–54. Yaowalak Apichatvullop; Wipawee Grisanaputi; and Charoon Prohmchum. 1987. 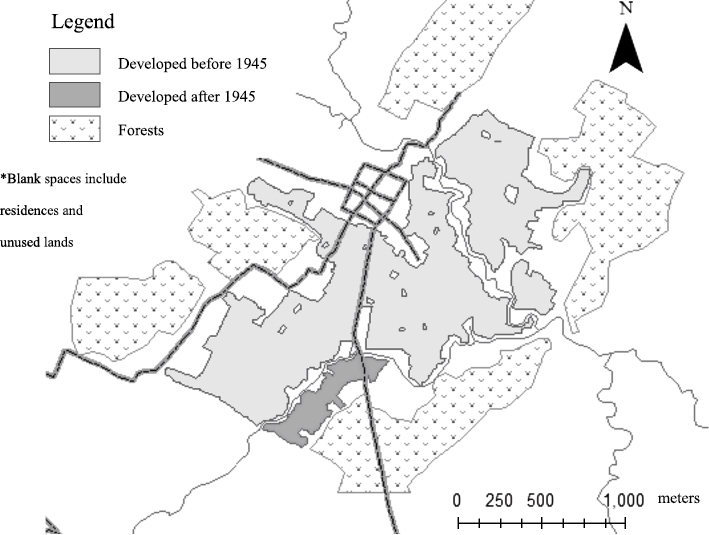 Household Use and Management of Trees: A Case Study of Don Chang Village, Khon Kaen. Khon Kaen: Khon Kaen University.